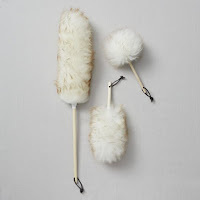 Have you purchased a Premium Lambswool Duster at Union Lighting? Available right by the front cash, this product comes in a variety of sizes. The wool is all white and the handles are made of durable molded plastic. Produced from the finest quality Australian lambswool, this product is perfect for cleaning chandeliers and broad surfaces like walls and open desktops. The wool's fine, crimped fibers form an intricate network which, when combined with the natural lanolin and scale-like surface of the wool fiber, trap and hold dust until spun free. We also have a Lambswool Mitt in stock, perfect for that next car wash of yours.